There are many ways that allergies can be prevented or the symptoms can be minimized, in a natural way, without the use or dependence upon over the counter medications. No one likes to suffer from seasonal allergies, or perhaps your allergies are more severe – but long story short, allergies are no fun! Many of you may not even realize that there are several different ways that you can try to minimize the effects of allergies and relieve yourself of symptoms that are completely natural and don’t cost significant amounts of money. Do you know what probiotics are? They are a form of healthy bacteria that helps rid our body from infections. Our bodies naturally produce bacteria (good bacteria) and they work to boost both our immune and digestive systems. Influencing the immune system in this manner may actually even address the root issue of your allergies to begin with – Acidophilus is something to consider! 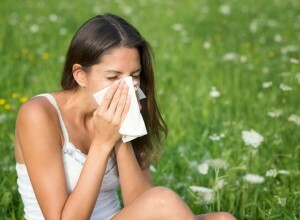 Increasing your immune system helps it fight off any issues that may try to affect you. This comes with infections, colds, viruses, etc. Like mentioned above about boosting your immune system – this can possibly reach the root cause of the allergies and make them go away for good. Your body just may be lacking enough fighting power to keep those symptoms away. Vitamin C also minimizes your body’s ability to allow histamine to form. A suggested addition of 2,000 mg is suggested to add to your daily intake. While it may not sound appealing to some, onions and garlic have amazing qualities all on their own. Quercetin is a bioflavonoid that naturally comes from onions which are known to reduce watery and itchy eyes, as well as relieve you from suffering from hay fever symptoms. Doing a little more research about the foods we eat and the properties they have naturally may help you readjust how you approach illnesses and allergies in the future. It is definitely worth checking into!